Contemporary and traditional textile artists, amateur or professional, are invited to participate. Whether you work in embroidery, rug hooking, quilting, felting, fabric painting, weaving, beading, needlepoint, crocheting, knitting or another technique, we look forward to exhibiting your work. This will not be a judged show; exhibit only. You are welcome to offer your pieces for sale. The Exhibit will run from Monday, November 5th through Thursday, November 29th (closed Wednesdays) 11am - 4pm; with an Artists’ Reception on Saturday November 10th from 5-7pm. 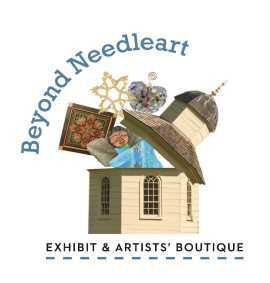 Concurrent with the exhibit, we will also have the Artists’ Boutique in the Central Passageway of the house, featuring a variety of vendors in fiber art as well as other mediums. Exhibitors are welcome to sell craft items in the boutique as well. The Boutique will run from November 5 thru December 28. To request a boutique application or get more information, e-mail montpeliermansion@pgparks.com. Montpelier is a 1780’s historic house, a National Historic Landmark site, furnished to the period of 1830, and is one of the finest examples of 18th c. Georgian architecture in the state. The house was built by the Snowden family who once had land holdings of more than 9000 acres. Programs at Montpelier include tours, lectures, afternoon teas, hands-on children’s activities for schools and other groups. To learn more about Montpelier’s history and programs go to history.pgparks.com. Entries will be accepted at the house (9650 Muirkirk Rd, Laurel, Md 20708) on Sunday, October 28, 3 - 6 pm and Monday, October 29, 11 am-2 pm. Entry fee is $5 per piece. Each entry must have a separate completed entry form (see last page) - photocopied forms are acceptable. Insurance coverage is the responsibility of the entrant. You may pick up your piece(s) on Thursday, November 29, 4-7 pm or Friday, November 30, 10am-2pm. The Exhibitor’s Receipt ticket must be presented to claim your piece(s). No pieces may be removed from the Mansion prior to the end of the exhibit. Remaining pieces will be available for pick-up by appointment, please call 301-377-7817. An additional $5 storage fee per entry will be assessed for storage, made payable to Montpelier Mansion/MNCPPC. Sales will NOT be handled by the Montpelier staff. This exhibit provides a venue to connect artists and potential clients. A small table will be provided to display business cards. Cards will also be provided for guests to fill out when they have an interest in purchasing a piece. Staff will notify the particular artist. If a piece is sold while on exhibit, the artist is to notify Montpelier staff so that a SOLD sign can be posted. All pieces will remain on exhibit through the end of the show. The artist/exhibitor will pick up all pieces, including those sold. It is the exhibitor’s responsibility to deliver sold pieces. While Montpelier will not be asking for any portion of the sale amount of any items sold, a donation would be appreciated for providing a venue that enabled your work to be viewed and sold. All pictures and wall hangings must be wired for display purposes. Quilts, rugs and fiber pieces should be no larger than 36” x 48”. If there are any special display requirements, please contact the staff to verify that your request can be accommodated prior to the drop off date. All artists are encouraged to volunteer a day or two to be available to answer questions about their art. The acceptance committee reserves the right to refuse and/or limit entries that are deemed inappropriate, unable to be properly displayed or not adequately secured. Newly crafted day long Artisan Escape, unique items designed to refine your technique and transform your art. What a great way to try many techniques at once in this day long escape. You’ll be experiencing so many new skills and not even realizing it because you’ll be having the artsiest time of your life! We begin our adventure with a most invaluable technique - creating a box top with your needlework, including the cording edge. You will receive a fabulous new design (to stitch later) and an artisan painted exclusive treasure box. (1st time in production, and only available through class with the girls!) 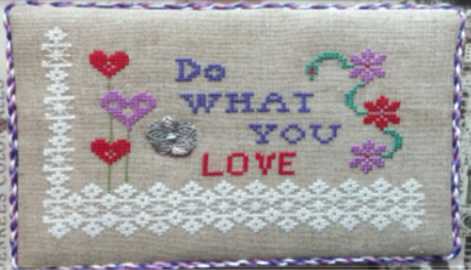 You will receive enough supplies to practice in class as well as finish the box after your stitching is complete. We then move into filling your beautiful chest, with a Fine Silver button and complimenting needleminder. You will be the alchemist! We will use Precious Metal Clay – reclaimed silver particles suspended in organic clay and then kiln fired to solid silver (done off site in Michelle’s kiln, you will return to pick up your polished, finished silver treasures. We went floral in our models, but there will be an extensive collection of molds available to use to create your own unique silver pieces. If you are the stitchers we are – you have that very precious pair of scissors, which will need to live in your newly crafted box! However! They simply can not remain bare, can they? To complete the day, we will produce more magic – with a sumptuous beaded tassel scissor fob. 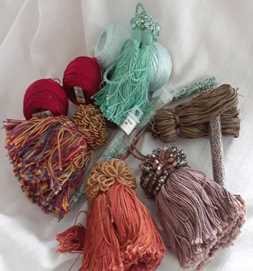 You will choose colors of pearl cotton and beads and Cathy will guide you step by step – to build and beautifythis capped tassel with beads. 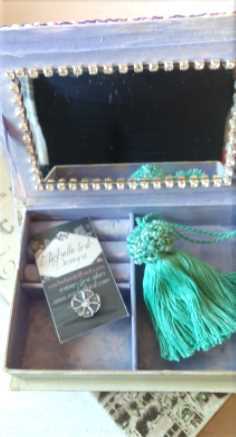 Pretty soon you will be constructing tassel necklaces, key chains, decor and more! A trio of friends - Gypsy Stitching can be found at Needlework events and Art Festivals- selling, promoting, supporting and growing our love affair with the Needle and thread and our craft!